Efficacité énergétique : Passez à l’action ! Pourquoi s’engager dans une réflexion sur sa consommation énergétique ? Quels gains énergétiques et économiques espérer ? Comment identifier les bons leviers ? Comment calculer la rentabilité d’un investissement sur ce sujet ? Quel est l’intérêt d’une certification ISO 50001 ? Cette rencontre sera également l’occasion de vous présenter le programme EE-METAL, porté par la METALLURGIE rhodanienne et soutenu par l’Union Européenne, qui vise à aider des PMI à améliorer leur efficacité énergétique. Comment intégrer le CO2 dans ses achats ? L’organisation ou le fonctionnement et enfin des premières préconisations pratiques pour commencer à intégrer ces émissions de GES dans vos marchés. Cette webconf’ s’adresse aux consultants et aux entreprises. Votre entreprise évoluera-t-elle de façon à assumer sa part de l’effort global de réduction des émissions qui permettra de maintenir le réchauffement du climat sous les 2°c ? Fera-t-elle évoluer ses métiers, ses services et son appareil de production en phase avec les multiples évolutions sociétales qui seront imposés par le changement climatiques pendant les prochaines décennies ? La méthode ACT (Assessing low-Carbone Transition), permet aux entreprises, investisseurs, instances publiques et autres parties prenantes de l’entreprise d’évaluer la compatibilité de sa stratégie avec une « trajectoire 2°C ». La région Auvergne Rhône-Alpes est un territoire à énergie positive, mais aussi le territoire de toutes les énergies innovantes. Avec la participation de grands groupes et pôles, de PME, de start-up et les élèves de l’Ecole Centrale de Lyon et l’Ecole des Mines de Saint-Etienne. Duration and timetable: 1 hour approximately. Mode of celebration: Free Webinar. After fill in and send us the registration form, we will send an invitation by email with a link to join the platform. Without displacement and completely online. In the tertiary and industrial sectors, control of energy through a number of essential steps that lead to certification audit. ATEE invites to a morning of technical conferences at which will be presented the different tools and techniques used as well as evidence that can help in a process management energy. Jornada Proyectos europeos eficiencia energetica. Participation y oportunidades. El proximo Wednesday 29 March 2017 will a celebrarse sober Jornada Proyectos europeos eficiencia energetica. Participation y oportunidades in the Camara Comercio of Madrid. SE abordara el tema Social challenge of energy inside the H2020 strategy to stimulate research and innovation, with the presentation of three energy efficiency projects subsidized by the European Union. It is interesting to know the interests of Europe to find joint solutions in energy efficiency. We invite you to that you may know these challenges and opportunities of financing so that companies can be more efficient and achieve energy savings. This Conference will feature, among others, the US-METAL project of energy efficiency in SMEs in the metal sectorwhere engaged AIN, as project leader, and AECIM, as a partner. VIII Dolnośląskie Forum for renewable energy will be devoted to energy efficiency in the enterprise. During the meeting, will be presented the current requirements for companies in energy efficiency in accordance with the requirements of the "law on energy efficiency" of 20 may 2016. Procuring funding for RENEWABLE ENERGY SOURCES. Participation in the meeting is free of charge. Upon registration. Energy efficiency for SMEs of the sector of metal (US-Metal project). Upper level "Technician in transport and logistics" in Dual mode training cycle. The next Thursday, May 11, at 12:00 o'clock You can solve all your doubts for proper certification of a "energy management system: ISO 50 001 in SMEs in the sector of metal"
AECIM, through the US-METAL European project, is working with SMEs in the metal sector for energy efficiency measures to be implemented in enterprises to achieve energy savings. We want to take this opportunity to make SinCeO2 tell us the advantages of the certification of energy management, in accordance with the norm UNE-EN ISO 50001 (control and reduction of energy consumption, verifiable financial savings, improvement of the) competitiveness, optimization of processes, reduction of greenhouse gas emissions, aid and grants to facilitate the certification). US-METAL European project: implementation of energy efficiency measures for SMEs in the metal sector. Advantages of the system certification of energy management, in accordance with the norm UNE-EN ISO 50001. Control and manage power: optimization of the reduction of financial costs. (Association of companies of Madrid metal) and AIN (Navarre Industry Association), within the framework of the European project us-METAL, organise a seminar of energy audits aimed mainly at people involved in the training or provision of services in the area of energy/renewable energy and energy efficiency, with the aim that know developed audit methodology and its application to SMEs, to be able to subsequently be applied themselves to other SMEs. Who is the seminar addressed? The seminar will take place during 8 hours in 1 day. We invite coaches from the scope of the wider energy efficiency to participate in free training on the preparation of energy audits in enterprises of the machinery-metal industry in accordance with the methodology established in the framework of the project EE-METAL. Number of places limited-decides order of submissions. Meeting "breakfast with an expert". "Aid and financing energy efficiency and renewable energy for businesses"
For the next June 22 from the Enterprise Europe Network of AIN "we have organized a Conference for the presentation of"Aid and financing energy efficiency and renewable energy for businesses", included in the European sustainable energy week. The Association of the industry of Navarra (AIN), on the Enterprise Europe Networkorganizes this day enterprises, which presents different options for access to financing in the field of energy efficiency and renewable energies at regional, national and European level. This day is framed in the European week of the energy sustainable promoted annually by the European Commission with the aim of encouraging companies to participate in the transition to a more sustainable use of energy. 17:00 h. - welcome and presentation of the Enterprise Europe Network. Support for the search for partners in European projects in the framework of the sustainable energy. 18:20 h. - success cases in Navarra. Efficient management of energy in industry: the case of Liebherr Industrias Metálicas, S.A.
David Jimenez- Head of production engineering of Liebherr Industrias Metálicas, S.A. 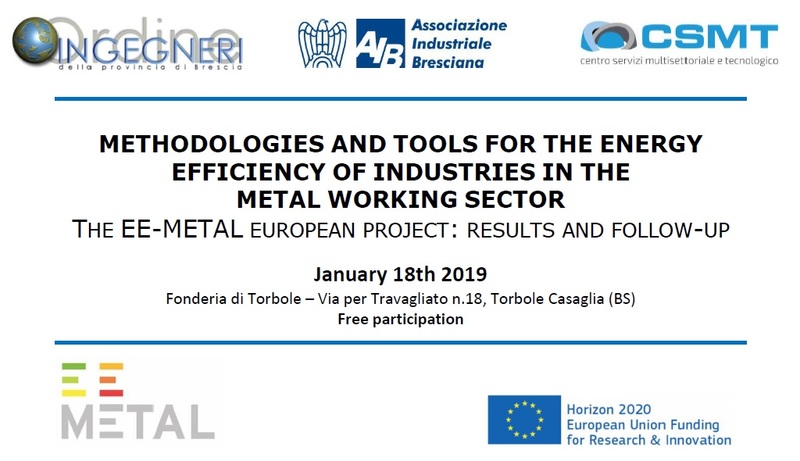 Presentation of the European project H2020 us-Metal "Applying Energy Efficient measures for metal and metalworking SMEs and Industry"
The management of the existing own use in the future, building on the process Industrial: innovating is less consuming ! By the EE-METAL program, Rhône metallurgy joins Tenerrdis, to the CETIM and to the ORDER organize a event on energy efficiency in the industry. The opportunity to bring together two worlds, «» Low energy & smart industry ': an overview of new technologies to design, measure and control the energy. Trade fair for energy efficiency in the industry an excellent opportunity to learn about innovative solutions to establish business contacts, promote products and services, and to exchange knowledge and experiences during meetings with specialists. In the course of seminars and discussions will be able to learn how to efficiently make use of heat and electricity and thus produce more efficiently, without damage to the budget and the environment. Participants learn about the prescription for increasing the competitiveness of products and services. Conference "energy and media technical production"
Optimal use and management of electricity and other technical media (compressed air, vacuum, water technology and living space, steam, gas, process gases) is the element to obtain significant savings in the enterprise. Is it possible by specifying the actual demand on the respective media. Therefore, the analysis of the status quo – automatic monitoring of technical media, their quality, develop systems for the transmission of information to the appropriate production planning according to the supply in the media, you can get significant savings. effective analysis, alerting and visualisation the key parameters of electricity. The workshop will be devoted to the issue of the quality of electricity. Their aim will be to show the finished tools for certified measurement and calculation of the main parameters of the power grid. At the disposal of the participants will position consisting of elements of the system of measurement of electricity parameters dedicated to the iba. Workshops are intended to give practical knowledge of tools used in the optimization of energy consumption and the possibilities of obtaining financing for investment performance. BOAT-FREE TRAINING "management of energy efficiency in practice – for SMEs industry machinery-metal"
Szczecin-FREE TRAINING "management of energy efficiency in practice – for SMEs industry machinery-metal"
RENEXPO ® (Renewable ENergy EXPOsition) Poland – is not only one of the largest and most important events relating to renewable energy, but also creates a platform for energy across the country. 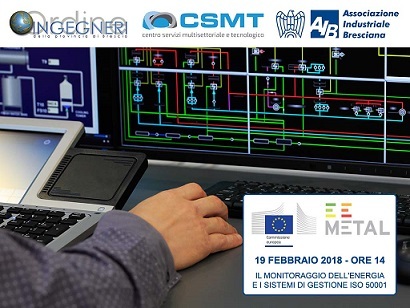 CSMT and AIB, in collaboration with the Association of engineers of Brescia, organize a workshop for professionals, industry experts and energy company technicians interested in exploring the theme of energy efficiency in industry of metals. The morning session is dedicated in particular to new regulations and funding opportunities; the afternoon session aims to explore the theme of energy benchmarks in steel mills and foundries, illustrating the benefits resulting from energy audits and by the mechanism of white certificates. The workshop is organized in the framework of the European project EE-METAL: the project was launched in March 2016 and has a duration of 3 years, with the main goal to provide businesses with different tools (managerial, technical, financial and training) useful to overcome existing barriers to adopting energy saving measures. 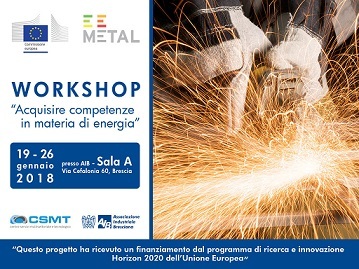 Thanks to the project the energy audits were conducted at 20 metalworking sector SMEs (according to UNI CEI EN 16247 from EGE UNI CEI 11339) whose results will be presented during the workshop. Anticipate the energy and solutions of the future for your business! An extraordinary adventure Energy Observer, the first ship to self-sufficient hydrogen, laboratory floating in all for around the world. Presentation by Florence LAMBERT, Director of the CEA Liten, godmother of the ship. -Workshop optimize costs of your business vehicles. ADEME organize Days technical certificates of energy savings (ERC) the 5 and 6 December 2017 at the city of science and industry in Paris, in collaboration with the Department of ecological and social Transition and the technical energy environment (ATEE) Association. an opportunity to gain visibility by presenting their feedback of the device EEC and their offers/demands on energy efficiency. Combining expertise and industrial experience feedback, this regional meeting is intended to help you become aware of the issues of the energy in our industry but also to make you discover the tools and approaches available to improve your energy efficiency. Training for professionals in SMBs "Become a benchmark energy"
Workshop "acquiring skills on energy"
WORKSHOP on "standard ISO 50001 and in SMEs in the metal sector energy monitoring systems"
10:00-10:15 AECIM - Jesús Yagüe, Director Dept. innovation. The energy audit: methodology of the US-METAL project in SMEs in the metal sector. 10:15 – 10:40 SinCeO2 - Maria Cubillo, Director General. ISO 50001 which is and how it is implemented. 10:40-11:30 AENOR - Juan Manuel Garcia, Manager of energy efficiency. Advantages of implementing ISO 50001. Case of success in the metal sector. 12:00-12:30 Efinetika - large Benito, CEO. Integrated management of energy and the energy (EMS) monitoring systems. 12:30-13:00 DALL'ANESE, National Association of energy service companies- Elena Gonzalez, Director of DALL'ANESE. SCADA systems. Case of success in the metal sector. Among the speakers, in addition to experts and consultants in the field, there will be some producers of SCADA energy monitoring systems and a certification body. Competitiveness reflects the potential of the company resources, skills and abilities to provide an advantage over other bodies active in the same sector. In the realities of the contemporary global economy competitiveness is becoming one of the most important determinants and prospects for health enterprise on the market, and is also seen as a determinanta development. During the event the experts shall communicate to the participants knowledge and skills in modern methods of production management. This will be an excellent opportunity for the discussion of practical aspects of production management and problems in making optimal decisions, managerial. Lectures will be hosted by m.in. Marek Amrozy – energy efficiency Manager, General Manager, National Agency for energy S.A.
"How to measure the energy efficiency of production? The role of the measurement data from the monitoring of the media and production in the optimum implementation of an energy management system according to standard ISO 50001 "
The Franco-German Chamber of Commerce and industry (CFACI) organizes, the Tuesday, March 20, 2018 a conference on energy efficiency in industry at the CCI of Lyon. The goal is twofold: promote the french and German markets Thanks to experts who will explain to prospects, technologies, as well as the current regulatory environment of the two countries. And initiate commercial and technological cooperation with German manufacturers. The meetings will be the March 21-22 (preferably within the French companies) and will be organised upstream by the CFACI. ESCO Services. How to develop them? How do I use them? New forms of energy efficiency of buildings. Is the construction industry ready for them? This webinar will cover how you can use ISO 50001 to improve your organisation’s energy performance, save money and carbon emissions, and comply with the UK Energy Savings Opportunity Scheme (ESOS) regulations. It will also feature a client case study. EU ENERGY DAY: intelligent power management organised by the Enterprise Europe Network in Torun Regional Development Agency Sustainable energy week 2018 (Sustainable Energy Week 2018). The meeting is addressed to entrepreneurs and representatives of local government units, interested in the subject of the clean and safe energy. Among the substantive partners are represented by the provincial Fund for environmental protection and water management in Torun, the Office of technical inspection, the University of science and technology, Energy Cluster "mountain air" Prosumer Cluster RES and Dachs and JV + and. Prelekcjom will be accompanied by a an exhibition of technological solutions from the energy industry, as well as presentation of examples of the implementation of the RES in the region. Coming soon on the organizer's website will be available a detailed agenda and registration form. Dentro del marco del Proyecto Europeo EE-Metal, perteneciente al programa H2020 de la Comisión Europea, el cual AECIM y AIN llevan ejecutando desde hace dos años, le informamos que el próximo miércoles 20 de junio de 2018 se realizará un WORKSHOP “Barreras a superar para la financiación del ahorro energético en PYMES del sector metal “, donde se hablará sobre la financiación existente hoy en día para proyectos de eficiencia energética en industria, desde el punto de vista de las entidades financieras así como el papel que juegan en este aspecto las empresas de servicios energéticos. Este evento es totalmente gratuito, y se realizará en las instalaciones de AECIM, en calle Príncipe de Vergara, 74, Madrid. 10:30 – 11:00 Instrumentos financieros para la Eficiencia Energética en Industria. 11:00 – 11:30 Financiación para inversiones en Eficiencia Energética: el papel de las ESEs (Empresas de Servicios Energéticos). Creemos que este workshop puede ser de su interés, y le invitamos a que participe. Para ello, únicamente necesitaríamos que nos confirme su asistencia indicando nombre y apellidos. El aforo es limitado. Si está interesado en realizar alguna reunión B2B con alguna de las empresas asistentes, únicamente debe indicarlo en su mail de confirmación. The European Commission, in partnership with the UN Environment Finance Initiative, is organising a webinar on the new Practitioner’s Guide on Energy Performance Contracts on 04 July 2018, from 11.00 to 13.00 (CEST). Eurostat, the Statistical Office of the European Commission, and the European Investment Bank (EIB) launched a new Practitioner’s Guide on the Statistical Treatment of Energy Performance Contracts on the 8th of May. The Guide explains in detail how these contracts work and gives a clear overview of the potential impact on government finances. This will assist public authorities in taking better-informed decisions when preparing and procuring their EPCs. This webinar is organised by the Executive Agency for Small and Medium-sized Enterprises (EASME) as part of the Sustainable Energy Investment Forums initiative, funded by the Horizon 2020 programme of the European Union. Please register here by 03 July 2018. Par choix économique ou par volonté de diminuer l’impact environnemental, les entreprises s’orientent de plus en plus vers une consommation d’énergie mieux maîtrisée. Plusieurs mécanismes d’incitation financière aux économies d’énergie sont à votre disposition. Elle se tiendra le 10 juillet, de 13h30 à 17h30, à l’institut des ressources industrielles (10 Boulevard Edmond Michelet, 69008 Lyon). For manufacturing companies, reduction of process cost means an increase of market competitiveness and better growth prospects for the future. In this sense energy efficiency could be an interesting lever that unfortunately it is not exploited sufficiently: often companies cannot provide human nor economical resources for activities that don’t directly affect their manufacturing process or core business. 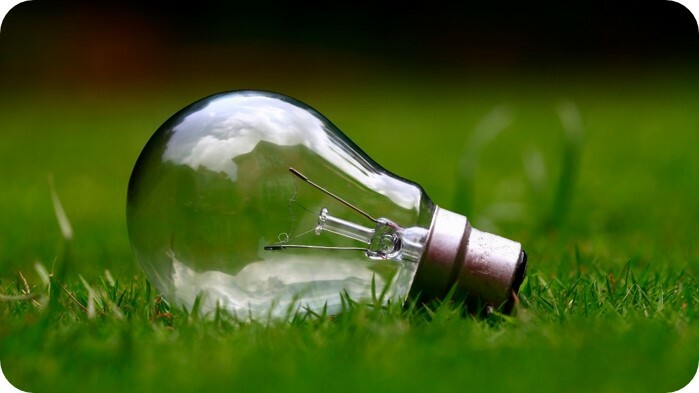 Energy Service Companies (ESCos) can flank enterprises in this path for improvement, from design and implementation of energy efficiency actions, to management and maintenance of plants. Often these activities are proposed with an interesting financial solution called EPC (energy performance contract), where full investment cost is born by ESCo, that receives part of the financial value of energy savings. During this workshop, different opportunities and proposals available on the market will be presented and direct contacts between enterprises and ESCos will be promoted through B2B (business to business) meetings. The programme of the eventi s attached. Participation is free but is available by registration. For more information and subscription to B2B meetings: ee-metal@aib.bs.it . German and international metal-cutting experts will meet at AMB in Stuttgart from 18 to 22 September 2018. More than 1,500 exhibitors will present their developments and innovations for metal-cutting and metal-removing process machine tools, precision tools, measuring systems and quality assurance, robots, workpiece and tool handling, industrial software & engineering, components, assemblies and accessories. During the premiere of the special show “Digital Way“ and the associated two-day Congress, AMB will demonstrate ways in which industrial enterprises can increase the potential of digitalisation by means of the latest information technology. The objective is to use AMB, as a platform for providers and users, as orientation which shows how the demands for higher sales and cost savings can be fulfilled, especially through increased employee productivity and greater machine efficiency. The closest Edition METAL 2018 will be held on 25-27 September. METAL markets are among the most important events of that type foundries in the world and is the largest of this type of event in Central and Eastern Europe. In the days of 26-28 September 2018 year in the International Congress Centre in Katowice will take place new industry Expo. This event, which will bring practical knowledge on how to change the company in the spirit of the idea of Industry 4.0. The event agenda includes dozens of sessions and workshops, presentations, workshops and events: the 15TH Edition of the Congress of the new industry, European Technology Forum and the Conference of mining. Within the framework of the 15th Congress of the new Industry we invite you to participate in the thematic session "Energy efficiency in an industrial facility". The meeting will take place September 26, 2018 in hours. 14:15-16:00 in the International Congress Centre in Katowice. 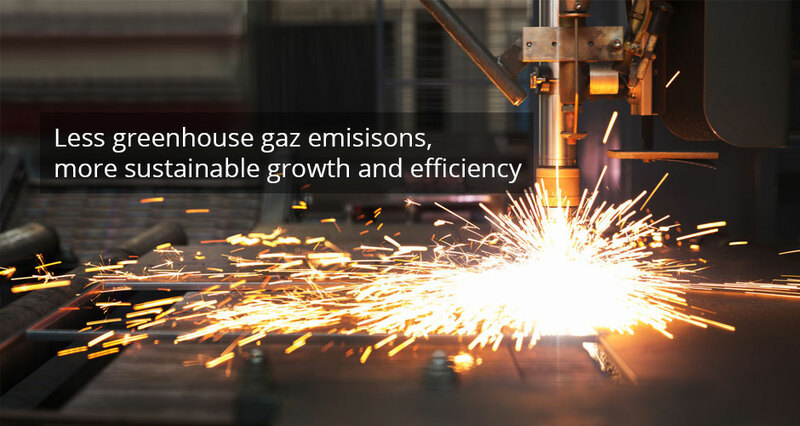 Energy-efficient industry – and the potential of further changes. How to successfully invest in a rational energy management? 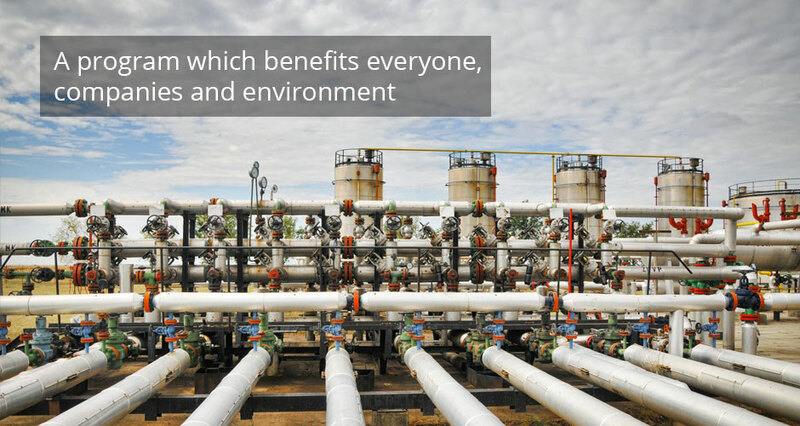 Services in the formula, or ESCO business approach to improving energy efficiency. 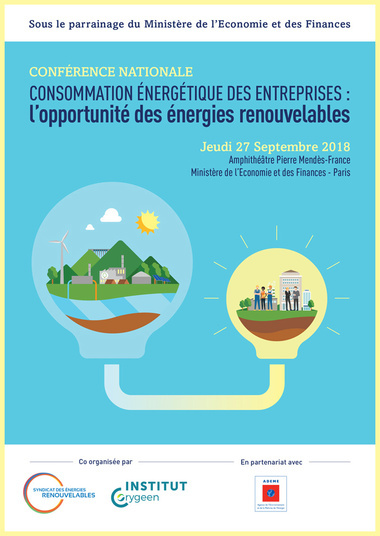 The SER and theInstitute Orygeen in partnership with theADEME you meet the Thursday, September 27, 2018 at Paris-Bercy for the National Conference under the sponsorship of the Ministry of economy and finance, entitled: "Energy companies: the opportunity of renewable energy". This first national event dedicated to sustainable energy supply of business strategies is designed to Exchange and provide answers to business and industry energy-consuming, wishing to turn to renewable energy renewable. 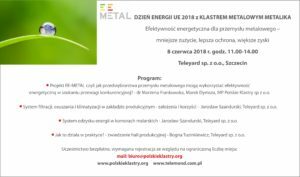 Technical Conference "energy and media technical production"
On the day of 27 września 2018 r. the Boat will be free Konferencja Techniczna „Energia i media techniczne w zakładach produkcyjnych”. Spotkanie skierowane jest do specjalistów odpowiedzialnych za optymalizację zużycia energii oraz obniżanie kosztów produkcji w zakładach przemysłowych, przy jednoczesnym zachowaniu jej wydajności i płynności. Wydarzenie stanowi okazję do poszerzenia wiedzy o najnowsze rozwiązania technologiczne, jak również zdobycia cennych kontaktów. Ciekawym dopełnieniem paneli prelekcyjnych i warsztatów będą stoiska konsultacyjne. Więcej informacji oraz program spotkania dostępne są here. ARMATURA PRZEMYSŁOWA – EFEKTYWNOŚĆ TERMOIZOLACJI ZDEJMOWALNEJ – CASE STUDY. Warsztaty są bezpłatne dla zarejestrowanych uczestników konferencji. Even more energy savings with the ISO 50001 version 2018! After 7 years of existence, the standard ISO 50001 renews itself. Nourished by the feedback of thousands of users worldwide, the new version of the ISO 50001 says his ambition: be the essential tool for organizations to permanently reduce its energy consumption and to demonstrate its energy performance! The European Commission, in partnership with the UN Environment Finance Initiative, is organising a webinar to discuss the Investor’s Perspective in Financing Energy Efficiency on Friday 28 September 2018, from 11.00 to 13.00 CEST. This webinar will be of particular interest to banks, investors, building owners, and asset managers. The webinar will be conducted in English. This will be the seventh webinar organised in the frame of the Sustainable Energy Investment Forums initiative funded by the Horizon 2020 programme of the European Union. 9. International trade fair for maintenance, Planning and optimization of Production-Maintenance This is the only event in Poland, to present a comprehensive technology and methods to prevent unplanned downtime and improve the efficiency of production of industrial plants. upgrading lighting in industrial plants. Detailed information about the trade fairs are available here. On 12 October as part of the renewable energy Fair RE-Energy Expo and Termoexpo-EXPO XXI Warsaw, Poland will be held a seminar "Overcoming barriers to financing energy-saving solutions in machine-metal industry SMES" organized in the framework of the project the EE-METAL under the auspices of the National Association of "respect for Energy and the environment" (a SAPE-Poland). Build awareness of energy efficiency solutions businesses. Potential to increase energy efficiency in SMEs industry metal-machinery-the Agency respect and Use Energy SP. z o.o. On the day of 17 October 2018. in Toruń, industry will be held the Conference under the name of "Automation and drive technology in manufacturing". Apply the appropriate drive technology is an important element to ensure safe operation of the devices, and even entire installations. It has an impact on productivity and the amount of energy consumed, and thus apparently translates into savings for the company. To participate in the Conference were invited practitioners, with which you will be able to discuss m.in. the issues of proper selection of a suitable drive technology, automation, effective integration or connections. Whether the constant supervision of the drive is possible? SELECTION AND PARAMETERIZATION OF SERVO MOTORS, BASED ON THE PLATFORM OF THE SYSMAC AUTOMATION. Detailed information about knferencji and workshops are available here. International Engineering Fair MACHinExpo will be held on 23-25 October 2018 r. and will be accompanied by the 12TH Edition of hydraulics, pneumatics and Mechatronics HaPeS. Warsaw Industry Week is International Trade Fair For Innovative Industrial Solutions, which will be held from 6-8 November 2018. During the event will be presented presented offer manufacturers and distributors of machinery, metalworking, woodworking machines, cutting machines, cnc machines, obrabiarkek machines, forming and laser cutting water, lathes, machining, CAD/CAM systems, software for industrial automation and Robotics in factories and production, measurement tools and industrial metrology, engineering maintenance, painting industrial, welding tools and other solutions for the wider industry. Nature of events attracts mainly representatives of such industries as transport, automotive industry, surface treatment, railway applications, welding, metallurgy, metallurgy, plastic metal, furniture or paint. Trade fair formula combines the presentation of large and small enterprises with the promotion of innovative solutions for the industry and industry conferences and workshops. Maria Netto from the Inter-American Development Bank will share about the experience of supporting the set-up of an ESI mechanism in South America and will provide further background and experiences. For more information please visit the Sustainable Energy Investment Forum webpage. Workshop energy "Technologies at the service of energy control"
The Conference will be held on January 17, 2019. stay Focus in Lodz, ul. Red 23/25. The meeting will begin at 10:00. Registration from 09:30. Patron of the event covered the Lodz Trade Chamber of Commerce and industry. Database of best available techniques (BAT) applicable in the sector. In addition, representatives of the companies participating in the project will talk about their experience of engaging in activities within the framework of the project, and invited guests will present examples of energy efficient solutions for use in SMEs and their financing. Participation in the Conference is free of charge. To look forward to January 14, 2019. Registration can be done here. AIB and CSMT orginize the Final Event of the EE-METAL project. During the event will be presented the project results and some case studies, with a focus on energy audits, ISO 50001 implementation and Energy Monitoring Systems. The event will close with a technical visit to a foundy where an ORC plant has been installed. Conferencia Eficiencia energética en industrias del metal. Dentro del marco del Proyecto Europeo EE-Metal – “Aplicación de medidas de eficiencia energética en la industria del metal”, perteneciente al programa H2020 de la Comisión Europea, le informamos que el 30 de enero de 2019 se realizará la CONFERENCIA “Proyecto EE-METAL: logros obtenidos”, donde se hablará sobre el desarrollo del proyecto EE-METAL, el cual está llegando a su fin, con especial incidencia en las medidas técnicas a implementar, contratos de servicios energéticos y productos financieros para aumentar el ahorro de energía en las PYMEs del sector del metal y, la experiencia lograda en la implementación en PYMEs del sector del metal de la ISO 50.001 Standard y sistemas de monitorización EMS/SCADA. Irene Eslava (AIN) Coordinadora del proyecto EE-METAL. 11:15 – 11:45 Análisis de las Medidas de eficiencia energética a implementar en PYMEs del sector del metal y tipos de contratos de servicios energéticos y productos financieros definidos para aumentar el ahorro de energía en las PYMEs del sector del metal. Edurne López (AIN) Técnico de proyecto de EE-METAL. Cristina Gallego (AECIM) Técnico de proyecto de EE-METAL. 11:45– 12:15 El papel de las ESEs (Empresas de Servicios Energéticos). 12:45 – 13:15 Experiencia de la implementación del sistema de monitorización energética en INREGAL, S.A.
13:15- 13:45 Experiencia de la implantación de la ISO 50.001 en CROMADOS OREJA, S.A.
Para ello, únicamente necesitaríamos que nos confirme su asistencia al mail irc2@aecim.org indicando nombre y apellidos. El aforo es limitado. The event will bring together projects from the 2014-2017 SPIRE calls but also other projects with significant relevance to energy efficiency in the processing industries. It will constitute an opportunity to take stock of the successes and challenges faced by projects, learn from each other, and strengthen the links among actors working in the field. A series of events organized under the theme "Industrial spring in the Kielce Fair" from year to year is more and more interest. One of the better developing exhibitions cycle are STOM-BLECH & CUTTING. Each year Kielce trade fairs, in the sheet metal working and cutting appear numerous manufacturers offering the highest quality machines and the equipment for the broader technology sector metal, profiles and pipes. Preparations for the treatment of: lubricating additives, components, coolant, etc. CONTROL-STOM is an opportunity to showcase the latest technology and acquire the necessary knowledge in the industry. Shown zostataną modern control equipment, test equipment and equipment laboratory spaces. A series of events organized under the theme "Industrial spring in the Kielce Fair" from year to year is more and more interest. One of the most important events of the cycle are STOM-TOOL. The exhibition has grown to a large European industry events-dedicated tools and CNC machines for metal-highly acclaimed among the exhibitors in the country and abroad. During the upcoming edition of STOM-TOOL 2019 appear numerous manufacturers of machine tools with the highest class machines and equipment. Institutions, research institutes, associations, research and development units, branch publishers. The WELDING trade fair organized in the framework of the series "Industrial spring in Kielce Fair" is an event from years of enjoying a huge appreciation among the companies taking part in the. The exhibition is an opportunity to showcase the latest technology and acquire the necessary knowledge in the industry. During the event does not run out of shows laser welding or heat treatment. The motto of this year's Edition is "integrated industry-industrial intelligence", which highlights the growing importance of artificial intelligence and machine learning in manufacturing and energy. Traditionally, every year the Hannover Messe partner country chooses. When you edit a 2019 it will be Sweden, which as a partner country will have the opportunity to showcase their new technologies, investment opportunities, innovative development strategies and research projects. Collaboration, innovation and digital transformation will be the center of attention of Sweden, and the main purpose of this country is to promote networking, trade and investments with partners from all over the world. Hannover Messe is the key industries and a wide range of technologies and innovations from around the world presented in the form of six lounges: Automation, motion & drives, integrated energy, digital factory, industrial supplies, ComVac, research and technology. The fair is also accompanying events, which will include more than 90 Conference, forums, as well as a special area for new companies. The session entitled "top industrial pioneers" will focus thought leaders and innovators from all areas. These are strategies and scenarios for the future of the industry, business, and society.